One-story T-plan side gable cottage with vinyl siding. Addition on north side with shed roof. 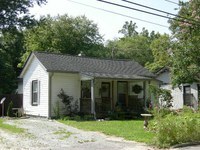 Original full-width porch has been replaced by modern shed roof center porch. Brick foundation, two-over-two windows, modern front door, small level lot. James C. Sexton, a driver, and wife Alice lived here from 1937 to 1938. Mayo A. Moffitt, a driver, lived here from 1939 to 1949, with his widow continuing to live in the house from 1950 to at least 1953.